Reviews were generally positive – local artists succeeded in creating some interesting pieces, and local residents (many strapped for cash as usual) were able to spend a cheap afternoon browsing the streets on the lookout for the new cultural additions to the neighbourhood. The Mural Fest also chalked one up for the City, who can now say it has generously sponsored local art. In the aftermath, project organizers and local media have framed festival as an “up-hill battle” against the conservative forces that govern public art in Vancouver as well as a general “win” for the city’s counterculture. There are, however, reasons to probe this narrative. For starters: tech gentrification. With the success of the “new economy” centered on information and technology jobs, cities on the West Coast have strived to create conditions favorable for tech companies and their employees. Famous examples include San Francisco and Seattle, where the likes of Google, Amazon, Twitter and Dropbox have attracted so much capital, the mass of employees they hire have displaced populations in previously working class neighbourhoods like the Mission and Capitol Hill. With the tech industry comes a young, educated, and highly mobile “creative class,” which local governments have sought to attract and maintain in hopes of boosting growth. In a short amount of time large scale street art murals, alongside food trucks and craft breweries, have become the prototypal cultural imprints of this emerging class. When viewed against the backdrop of the economic and cultural forces transforming the neighbourhoods north of Main Street and Broadway, the Vancouver Mural Festival fits comfortably within a pattern of municipally-led gentrification and tech redevelopment. 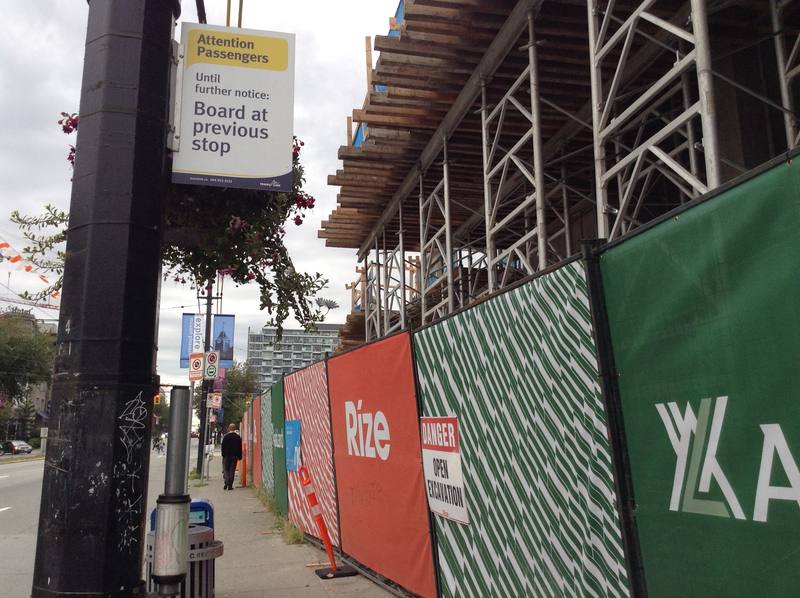 How is tech gentrification affecting Vancouver? Mural Fest took place primarily in the False Creek neighbourhood bounded by Clark Drive, Cambie, 12th Avenue and Terminal Avenue. This area is historically home to light manufacturing and working class jobs. More recently, the zoning district, along with the False Creek Flats on the east side of Main Street, have been targeted by the city for extensive commercial revitalization and attempts to spur Vancouver’s tech industry. While the industrially zoned neighbourhood offers little potential for residential displacement, the changes occurring here correspond to geographer Jason Hackworth’s definition of gentrification as the “the production of space for increasingly affluent users.” And as new tech jobs spill into the Downtown Eastside, with plans for a tech hub at the former police station at Hastings and Cordova, this form of gentrification has a strong likelihood of displacing the low-income community. If we trace the map of Mural Fest we can see an outline of murals surrounding new start ups, condos, breweries and coffee shops, including two at the long-protested Rize Development’s 21-story tower at the corner of Main and Broadway. Rize is gaining publicity for the mural on its exterior, while construction at the site has closed down a key bus stop of the #19 bus on Kingsway at Broadway. Those relying on public transit, many with disabilities and strollers, must now walk to the next stop to catch the bus – a symbol of the larger effects Rize will have on the working class Mount Pleasant community. The showcase piece for the Vancouver Mural Festival is on the exterior of Vancouver’s tech industry poster child, Hootsuite. Located at the former CSIS headquarters, the building’s brutalist façade is now adorned with a brightly coloured geometric pattern. Hootsuite moved into their current site after a likely-favorable secret deal between the Hootsuite and the local government. More recently the tech firm plans to expand to another site in the neighborhood, teaming up with Westbank (of Woodward’s infamy) to purchase a square block of land between 4th and 5th and Main and Quebec. The company is currently lobbying the city for increased density on the site which could net them millions of dollars in profit. In the context of a severe housing crisis, one which the mayor consistently claims he is unable to do much about, one wonders if another round of public money should be used to help repaint the headquarters of one of the city’s most successful tech start-ups, turned speculative developer. Until recently, the City of Vancouver has had a pretty terrible history with street art. With the announcement of the 2010 Olympic games in 2002, many of the city’s historic graffiti “free-walls,” including those at Main and Terminal and in False Creek near Granville Island, were permanently painted over. The Vancouver Police Department also created a vandal squad to surveil the graffiti community, while semi-private entities such as the Downtown Ambassadors were used to target small-scale crimes of “disorder” such as loitering, sleeping outdoors and tagging. Vancouver exemplifies the larger trend, noted by academics, of the increasing closure of the public sphere under neoliberalism and the aggressive policing of the “unsanctioned” use of space. Street art as a movement, popularized by artists such as Shepard Fairy and Banksy, emerged as a form of protest over the commodification and closure of space in cities across the globe during the 2000s. More recently, however, street art mural festivals in gentrifying neighborhoods have sparked controversy in various global cities. In a Facebook post that went viral earlier this year, activist Ah Kok Wong reacted to a international graffiti festival in the low income Sham Shui Po neighborhood of Hong Kong, stating: “Whoever participated [in] this event made [life in] the poorest Hong Kong community harder than ever, thanks to your ‘art’ and top-down ‘aesthetics.’” Returning to the case of Vancouver Mural Festival, we see how street art and graffiti can be used by cities to appear progressive, while at the same time maintaining an agenda of up-scaling and gentrification. Should we be opposed to murals and public art in general? Absolutely not. However, the timing and location of Vancouver Mural Festival, amidst tech re-zonings and sprouting condo towers prompts troubling questions. In his recent book After Euphoria, local critic and cultural theorist Jeff Derksen discusses how a “cumulative texture” in cities is produced through the transgressive use of public space. By slowly stripping away that texture and replacing it with a sanitized version tied to profit-seeking and speculative interests, Mural Fest helps to produce a distorted mirror image of the city. In America, state and corporate sponsored mural projects, such as those by Shepard Fairy, have frequently been “bombed over” by graffiti artists hoping to preserve the art of illegal tagging as a status quo challenging activity. In this case, the overt celebration surrounding Mural Fest in the local media and lack of critical insight is disconcerting. We should be demanding not just pretty murals to look at, but real spaces of transgression where art and critique can flourish. Zachary Hyde is a PhD candidate in the department of sociology at UBC. He grew up in Vancouver and now studies issues of housing and gentrification in Canadian cities. Posted in Gentrification, Mount Pleasant and tagged Gentrification, Mount Pleasant, Rize. Bookmark the permalink. Good article! I would also add that there is a visual hierarchy within the festival itself. The more vapid the mural, the more prominently it is featured in public spaces. The works that are more confrontational in their politics end up hidden in alleyways, like this piece featuring Haida-style salmon & protesters going up against riot cops: http://i.cbc.ca/1.3731798.1471919082!/fileImage/httpImage/image.JPG_gen/derivatives/original_940/vancouver-mural-festival.JPG I guess this kind of marginalization makes sense though considering who is funding it, and the kind of people City Hall are pandering to. Honestly, this is exactly what’s happening at local studio houses, being pushed out of their studios more than three artist I know, good ones..have to consolodate a move out and find joint studios, home studios..where space is cramped and they can’t do their art as comfortably, therefore creating stress, for a already bewildering reality of poverty and wasting baby bommer lifestyle “neoliberalism”. People who run these places have only their overhead in mind ..not the artists..they are admistrators, and directors running these places. And though I agree many artists are poor at business we need real representation by resources to provide space and leadership for artist communities to create..not a lovely mask for our alleyways and street fronts.. As property taxes go up over 300% overnight, give us room and a commune with artists…its simple, isn’t it. no, actually, it’s really refreshing to see some well thought out “mural” work that doesn’t insult the whole idea of “artist”… those turgid, poorly drawn things that are so widespread (the murals painted on the assumption that “everyone is an artist”) are about the equivalent of saying that someone who is tone deaf is exactly the same in terms of work, effort and listenability as a professional musician… so, if you do appreciate someone who has put a lot of effort into learning their craft, then your in favour of “gentrification”… it is so tiresome to see these publicly funded, poorly composed, poorly painted and poorly drawn murals all over the place! would disagree that the city used graffiti artists to further an agenda. The percentage of square footage that graffiti artists were given for this mural festival was probably less than 5% of all the wall space that was painted, and to top it off they were hidden in a secluded space away from the public eye in an alley that no one uses. The COV graffiti management program has been very successful in curtailing traditional graffiti art by creating arbitrary policies that require that graffiti art only exist within a larger context (graffiti lettering for example is only allowed to cover 30% of a public mural). These policies are implemented by non-artists, usually city managers who at some point worked for another department. These people have no connection to the art community whatsoever, but are the people directly in charge of curating what is allowed to painted. Why are we allowing public space to be curated by a group of people who aren’t even connected to our communities? Also, the lack of spaces artists can afford to rent is deplorable. There is nothing sustainable that came out of this mural festival that would see more artists spaces created or subsidized. It was simply a cash offering to those already struggling to survive in this real estate fiasco for some. A few artists get paid some quick cash, and get to have some exposure .. great.. but what has this done to ensure the viability for future artists to survive in this city? 200,000 square feet of artists space will soon be opening on Granville Island. That is bigger than 1000 Parker St.
Emily Carr is moving and CMHC wants to fill the old school with artists. They are currently conducting a “2040 Vision” study to get public input on the uses for the old school. 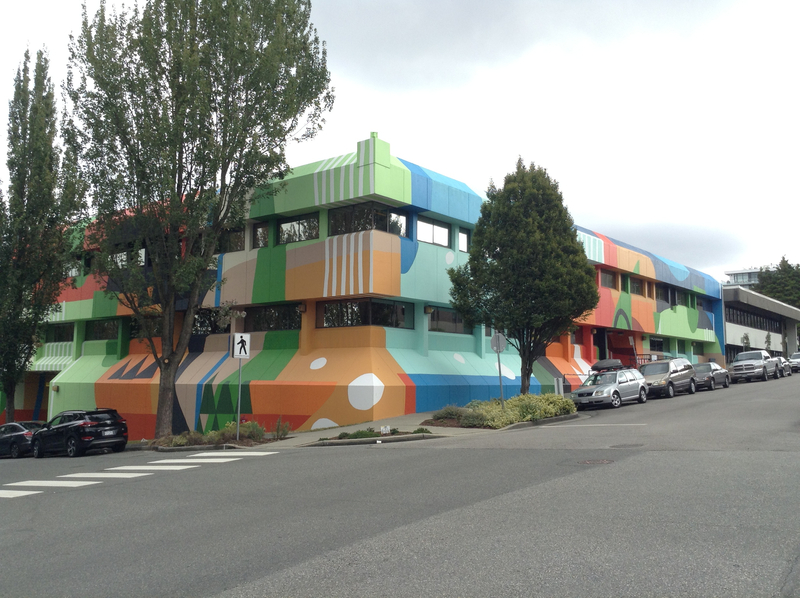 We could have 500+ new art studios in Vancouver if people step up and make their views known. Workshops are currently being held regularly. 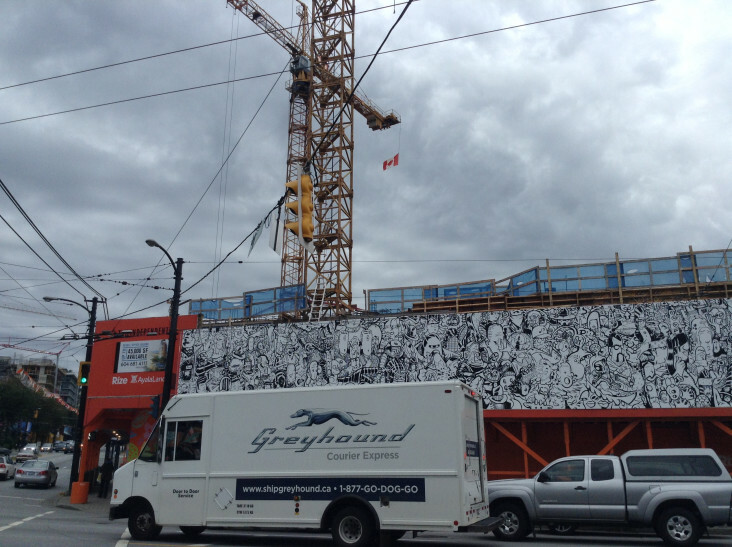 the new murals had nothing to do with high prices in Vancouver. Are you suggesting we make the city look ugly to make housing prices go down? When the walls were grey people still wanted to live on Main Street. And the artists can’t do perspective. All the pictures and murals are flat, no illusion of depth. Yes, this is land speculators prettifying an aging district, but it is also not art, there is no policy of longevity as in Montreal. Very nice…however, people are homeless and living on the streets in Vancouver. $200,000.00 should have been spent on something to help those in dire need. What a waste of taxpayers money. This mural fest , was the first one of its kind in Vancouver . There were a lot of imposed rules by the city and those rules set an incredible amount of constraint for the artists involved. The walls belonged to businesses that demanded a certain type of “art” that serves more as a decoration . We need artists that wont succumb to this aesthetics of Vancouver. We need artists to go out there and take back their walls , under their own terms … and also we need Vancouverites to stop complaining about every little damn thing! yeah, ..how about some initiatives for people that are actually suffering from gentrification. it’s obviously not these artists they have a voice, who isn’t represented by this is exactly the homeless that are slipping through our fingers faster and faster, …and as they teach us “winter is coming”. this post is about gentrification, ..not exactly whether the art is poignant or not when we have such a great cast of artists. Art will always have critics who sideglance the real issue. The fact that the rich will not take responsibility for those that are marginalized. Political dogma galore…just admit it. So an artist that accepted 10,000 dollars from the Royal Bank of Canada posted this on FB. How is that OK but decorating some buildings, unequivocally in the name of capital, is not OK. I think someone else alluded to this but this just seems elitist. Because mural art is decoration it is not real art. And yet the biggest sponsors of art in the city are major real estate developers. So is all art bad because it is a function of capital? Also you spelled Shepard Fairey’s name wrong. Hi Sean. Thanks for your comments. If you would like my response to the last question you posed you can read the last two sections of my piece “Why Mural Art Now?” and “Public Art without Gentrification.” There is an in depth discussion of these issues as well as citations of both academic and popular literature on the matter. Thanks also for the correction of the spelling of Shepard Fairey. As for breweries displacing working class jobs in Mount Pleasant, um, it was called Brewery Creek.